スペシャルヴァージョン (Special version) as it involves the voice cast behind the main characters of the game and also some of the background music (BGM) that features during the battles! You can watch some of the trailer videos at the official Tales of the World: Radiant Mythology 2 website but seeing as the musical styles of the BGM and BACK-ON‘s usual musical style is really quite different, it will be VERY interesting to hear this remix imho! Of course, one mustn’t lose sight of the fact there are 3 brand new songs by BACK-ON on this single, where the titles of all the songs seem to have connotations of creating a new beginning… I think. What are your thoughts? I am really liking this potential ‘return’ to what appears to be themes of light and hope, as they were, I believe, something that the band were aiming for with several of their songs (more noticeable in some than others) and am very much looking forward to hearing previews of the new songs! 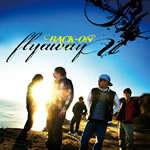 Before I forget… the brand new official profile photos for 2009 and to promote flyaway! I love Gori‘s new look in particular this time round, although he looks awfully serious; Kenji03, sadly, is missing the glasses from the promotional photos of YES!! !, although Teeda is still sporting some very nice sunglasses this time round! HAPPY NEW YEAR FOR 2009 AND ENJOY THE CELEBRATIONS! Thank you to everyone who has been so helpful and supportive to our site this year. It has been a great 12 months for BACK-ON and ourselves, even if the updates on our site have been a little sporadic, but the band have really gone from strength-to-strength, especially with the release of their first full album, YES!!! We would also like to say a very special thank you to the fans who have contributed their talent, time and their energy both on our main site and on the Forums. We will see you next year with lots of BACK-ON related updates and very much hope you will all continue to support both BACK-ON and ourselves in 2009! There is a demo PV on the Official website now and omg…the song is freakin AMAZING. I believe it might beat my favorite song: New World. XD I’m very happy to order the limited edition. Don’t worry Flick, we shall see some bigger scans! I can’t wait! 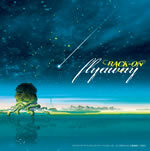 The song took my breath away, which should be good! oh ya and i forgot to yell and scream NOOOOOOOO!!!!!!!!!!!!!!!!! why did icchan get a wierd haircut? although i guess its better then another one of his but NOOOOOO!!!!!!! !